The annual meeting of the American Society for Environmental History (ASEH) is one of the most engaging and vibrant academic conferences I’ve been to. This year, in San Francisco, I’ll be presenting some of my research on Yonge Street as part of a panel on citizen engagement and the environment in urban planning. 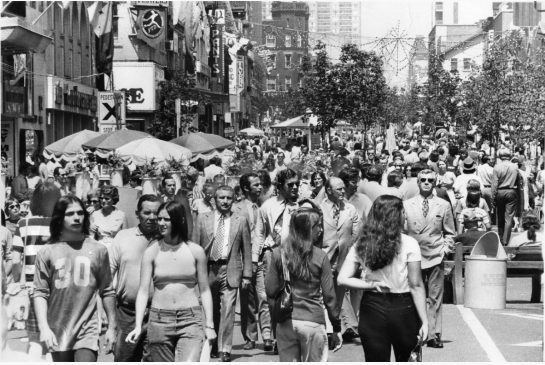 Specifically, I’ll be discussing the Yonge Street Pedestrian Mall, which closed the street to traffic each summer from 1971 to 1974. My three co-panelists and I are trying to answer a basic question about twentieth-century cities: how have they been shaped by citizen activism and concerns for building greener, more “liveable” spaces? We study four different cities in three countries. That, and the fact that our moderator is an exciting young urban historian (Catherine McNeur) makes for a promising session. This entry was posted on March 10, 2014 by Daniel in conferences, Toronto.